The stone was 8 inches in diameter, 18.62 inches in circumference and weighed 1 pound, 15 ounces. (CNN) -- A South Dakota ranch worker who found a record-setting hailstone says the chunks of ice falling from the sky sounded like "big bricks" being thrown at his house. Leslie "Les" Scott found the record-breaker, which is almost the size of a soccer ball, last week. It's been been officially declared the largest ever recorded in the United States, in terms of both diameter and weight. The hailstone measured 8.0 inches in diameter, had a circumference of 18.62 inches, and weighed one pound, 15 ounces, according to the NOAA National Climate Extremes Committee. Scott says larger hailstones fell around the tiny town of Vivian, South Dakota last week. As severe thunderstorms swept through the area on July 23, Scott says he and a few friends gathered on a hilltop to watch the weather system. He abandoned his position when he saw twisters taking shape in the clouds, but continued watching the storm from his home. He told CNN that he saw hailstones that were as large or larger than the one he actually kept. In fact, Scott said the smallest hailstone he found was about the size of a tennis ball. Damage around the town is also evidence of the unusual large size of the hailstones that fell, according to Scott. He said there are patches on every home in Vivian. 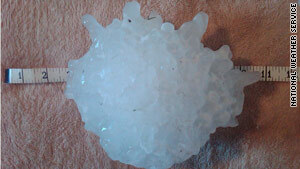 Hailstones punched through many roofs and ended up in attics and even bedrooms. Scott immediately took steps to preserve his unique specimen. But the after-effects of the storm interfered. He put it in the freezer but a power outage lasting 5 or 6 hours caused some melting. Scott said many of the ice "fingers" that first attracted his attention disappeared and the entire hailstone shrank a bit. He believes it was up to eleven inches in diameter when he picked it up the first time. With the focus in Vivian firmly on cleaning up and repairing homes, Scott seems bemused by the new-found notoriety that has come along with breaking a U.S. record. He wasn't even the one who notified weather officials about the hailstone. News about its unusual size actually spread by word-of-mouth. Scott says he was surprised when he started getting calls from the media. It was the weather office in Aberdeen, South Dakota that notified regional weather authorities about the discovery. They asked the National Climate Extremes Committee to evaluate the stone. Official measurements were submitted to the committee of three, who then certified that the hailstone was a record-breaker. Scott says the weather in his area has been "way out of whack" all summer. It's been much wetter than normal, and says he can keep track because he has to cut the grass about twice as often as he normally does. Even Scott's mother has been talking about how strange the weather has been during the summer of 2010. She's celebrating her 86th birthday Friday, and Scott says she's never seen anything like this before in her life. Scott's hailstone actually broke two previous records. The previous record in the weight category came from a hailstone that fell in Coffeyville, Kansas. It weighed 1.67 pounds. The previous record-holding hailstone in the diameter category fell in Aurora, Nebraska. It measured 7 inches across. This stone -- at 18.75 inches -- still holds the hailstone record for circumference.